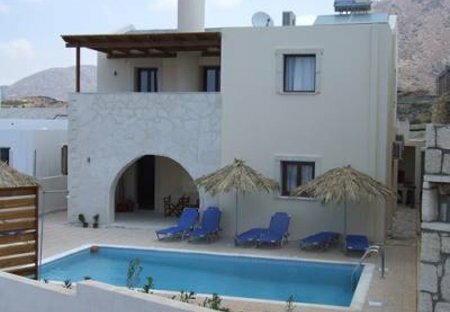 Rent villas and apartments in Ierapetra, Crete with private pools. Book affordable holiday rentals that are near a beach. The 94 m2 sunshine property is located in eastern Crete.Is surrounded by an olive tree garden from the South,with a view to the sea and facing the beautiful mountain to the North. A Three bedroom Family villa offering full privacy with swimming pool. Daidalos maisonnettes with 2 bedrooms, spacious living-room and huge terrace with uninterrupted sea - mountain views, just 50m from the beach. This exclusive single storey 80m2 Bay View Bungalow is designed with style and the finest architecture, offering an exclusive lifestyle just 300 meters from the beach. Aeolus self catering 5 bedroom private holiday rental Villa with garden and private pool above the sea in Makrigialos, Crete. Ideal place for relaxing holidays. Exclusive Bayview Penthouse designed with style and the finest architecture, offering an exclusive lifestyle just 300 meters from the beach. Stunning Sea and Mountain views. This exclusive two storey 86m2 Bay View Townhouse is designed with style and the finest architecture, offering panoramic sea and mountain views, just 300 meters from the beach.